(transitive) When you need a specific piece of information and use sources such as a dictionary, telephone book, or search engines (such as Google) to find that information or to get an answer. Synonyms: search, seek, investigate, research. I looked up the number of the restaurant in the phone book. Could you look up the President’s birthday on Google for me please? I wasn’t sure of the word’s meaning, so I looked it up in the dictionary. He looked up the word. He looked the word up. * When a pronoun is used, it can only go in the middle position. (intransitive) To have better prospects and to show promise of improving. When something is on an upward trend or is increasing. 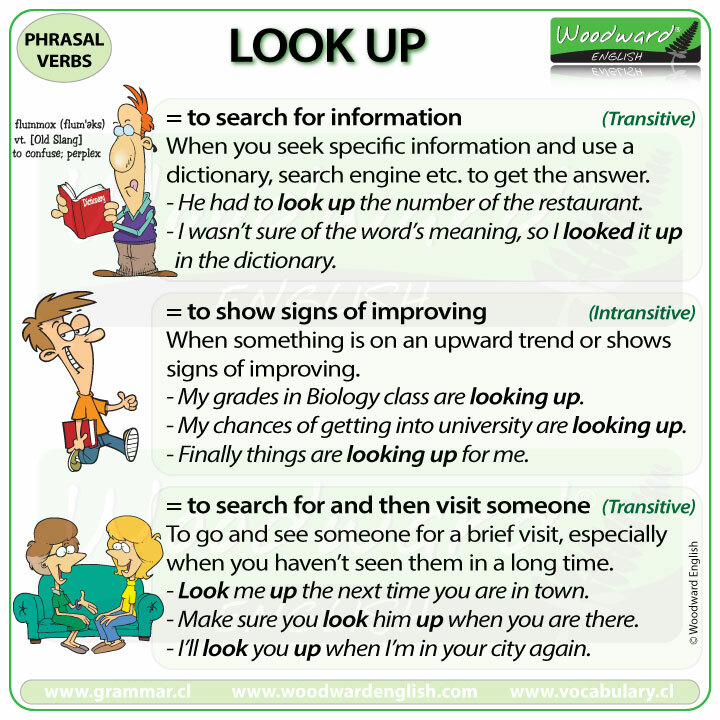 Note that with this meaning, the phrasal verb is normally in the progressive tense. Synonyms: improve, recover. My grades in Biology class are looking up. My chances of getting into the university are looking up. Finally things are looking up for me. Look me up the next time you are in town. Make sure you look him up when you are there. I’ll look you up when I’m in your city again.